No priest, no theologian stood at the manger of Bethlehem. And yet all Christian theology has its origin in the wonder of all wonders: that God became human. Holy theology arises from knees bent before the mystery of the divine child in the stable. Without the holy night, there is no theology. "God is revealed in flesh," the God-human Jesus Christ—that is the holy mystery that theology came into being to protect and preserve. How we fail to understand when we think that the task of theology is to solve the mystery of God, to drag it down to the flat, ordinary wisdom of human experience and reason! Its sole office is to preserve the miracle as miracle, to comprehend, defend, and glorify God's mystery precisely as mystery. This and nothing else, therefore, is what the early church meant when, with never flagging zeal, it dealt with the mystery of the Trinity and the person of Jesus Christ…. If Christmas time cannot ignite within us again something like a love for holy theology, so that we—captured and compelled by the wonder of the manger of the Son of God—must reverently reflect on the mysteries of God, then it must be that the glow of the divine mysteries has also been extinguished in our heart and has died out. 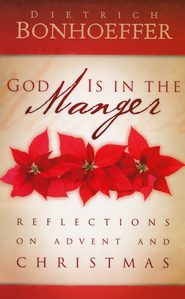 (Dietrich Bonhoeffer, God Is in the Manger: Reflections on Advent and Christmas).